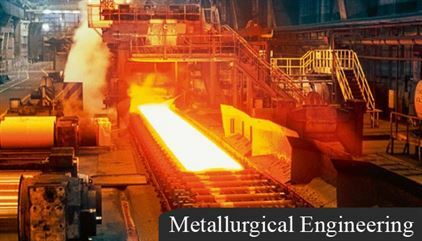 Metallurgical Engineering is a broad field of engineering that deals with all sorts of metal-related areas. It is branch of engineering that deals with a study of science of metals and their properties, including separating metals from their ores, formation of alloys and heating metals to change their physical characteristics. Physical metallurgy: Deals with problem solving: you’ll develop the sorts of metallic alloys needed for different types of manufacturing and construction. Extractive metallurgy: Involves extracting metal from ore. Mineral processing: Involves separating commercially valuable minerals from their ores. For admission in a bachelor’s degree, the candidate must have passed the higher secondary school certificate (10+2) examination with science subject such as Physics, math’s and chemistry. For IITs, It is mandatory to qualify in the Joint Entrance Examinations (J.E.E). The duration for this course is 4 years. Metallurgists are employed in foundries, heat treatment shops, rolling mills, etc. industries. They are also employed in research laboratories, industries and plants extracting and processing metals like iron and steel, nickel, tin, copper, zinc, aluminium and brass etc. Tata Iron and Steel Company at Jamshedpur and steel plants of Durgapur, Bhillai, Rourkela and Bokaro also employ them. This article has compiled information from various sources to impart knowledge regarding job prospects and scope of metallurgical engineering as career option with a hope to help our subscribers in choosing their desired field of metallurgical engineering as a profession.